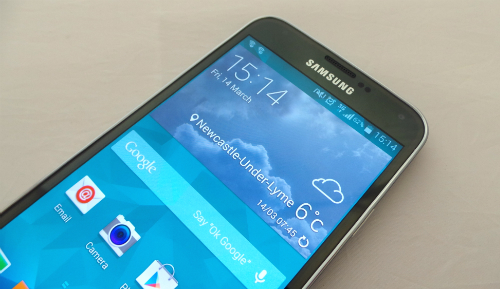 Samsung has received high praise for its new flagship phone, the Galaxy S5. The new model features key updates and improvements, including a new processor, 16MP camera, 128GB SD support, fingerprint scanner and software updates. These revolutionary additions should help the company maintain its market share – keep in mind that Samsung already has the most popular Android based handset. However, the launch of the HTC One M8 poses a definite threat to Samsung’s dominance. So how does the Galaxy S5 stack up? Can all the superb features and improvements live up to the hype? Let’s dive in. 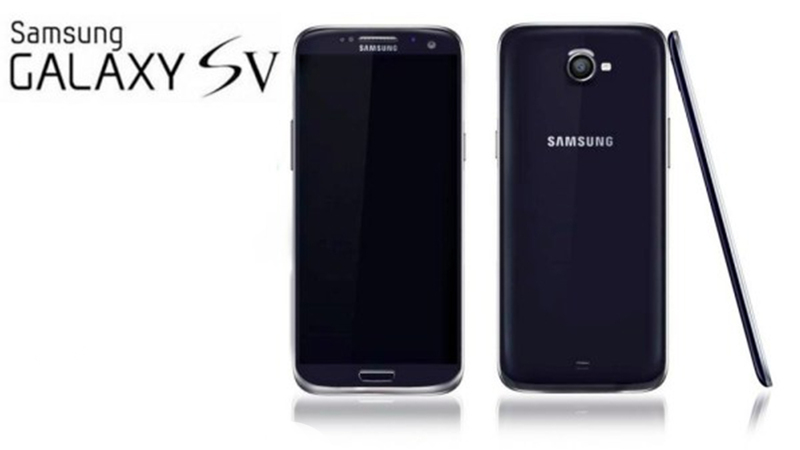 If you’re expecting a grand redesign, you’ll be severely disappointed with your new S5. There’s very little to distinguish the new handset from last year’s S4 apart from the dimpled back panel, which provides better grip. Samsung also presents new color options – Charcoal Black, Shimmery White, Electric Blue and Copper Gold – with this release. While the company loses points for the overall design, they’ve more than made up for it with the phone’s display. The Super AMOLED 1920 x 1080 pixel display beats its LCD rivals and provides a real wow factor. At 5.1 inches, the display is slightly bigger than the S4. Add that to the 5.39 x 2.75 x 0.311 dimensions and 4.58oz weight, and you’ll notice that the S5 is bigger and a tad heavier than its predecessor. Still, it’s smaller than the bulky HTC One M8 but heavier than the Nexus 5. The upgraded speed and boatload of features are what sets the S5 apart from previous models. Like the Sony Xperia Z2 and HTC One M8, the S5 gets Qualcomm’s new Snapdragon 801 processor and Adreno 330 graphics. The combined improvements make for a lag free experience. That’s not to say the S4 is a slouch; not be any means. However, the power saving abilities of the 801 chipset truly sets the S5 apart. According to the manufacturer, the phone will deliver 10 hours of LTE web browsing, 11 hours of video, 21 hours of talk time and 390 standby hours. So far, those figures translate well in the real world. Of course, the new 2800mAh battery helps maintain battery life, especially for people who put their smartphones to heavy use. But that’s not all: Samsung introduced the Ultra Power Saving Mode, which will provide up to 24 hours with only 10% battery remaining. Another feature worth mentioning is the S5’s water resisting abilities. In order to take advantage of this feature, you’ll need to protect the power port by keeping the accompanying flap closed. Sure the flap feels a bit flimsy, but Samsung promises it will protect your phone from water damage for up to 20 minutes in 1 meter of water. Go ahead and put your phone to the test by taking a quick underwater photo or answering the phone in the shower, but please, don’t go swimming with the phone in your pocket. 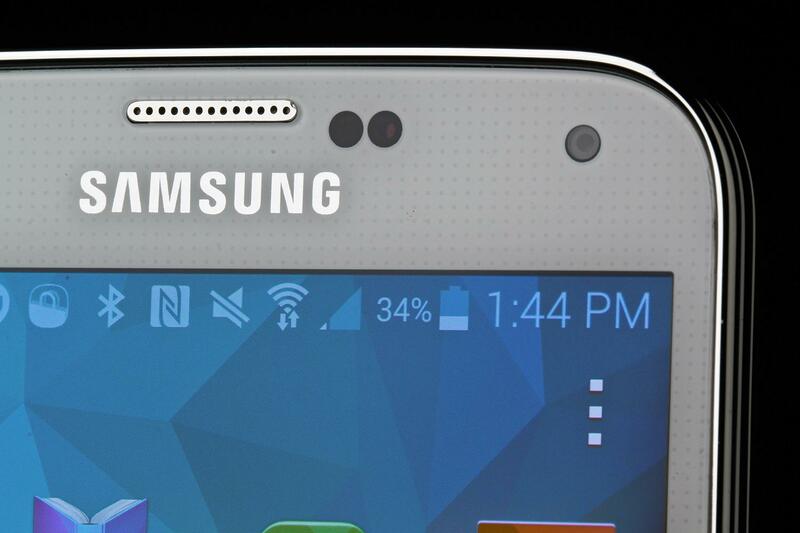 Admittedly, S Voice and eye-tracking were not huge hits on the Galaxy S4. But this time around, biometrics such as the heart rate monitor and fingerprint scanner will prove to be more in line with what users want. You can use the fingerprint reader to lock and unlock your phone, but don’t expect the phone to read your fingerprint on the home button (like the iPhone 5S). The S5 employs a much older technology in that you’ll have to swipe your finger over the reader – and hope the phone recognizes it. Don’t be surprised if you need to swipe a few times before you get it right. Fortunately, Samsung compensates for this shortcoming by incorporating a biometrics-based digital wallet that supports PayPal. Just think of the possibilities! New in this model is the ability to monitor your heart. The heart rate monitor is located just below the rear camera, and all you’ll need to do is place your finger on the monitor for 5-10 seconds to get your pulse rate. This useful feature works in tandem with Samsung’s Health 3.0 app, which tracks your location and steps and counts your caloric intake. So here’s an area that will no doubt receive mixed reviews. According to Samsung, the UI has been “refined to provide a clean and uncluttered look.” The S5 retains the basic navigation of the S4; however, the UI is obviously closer to Google’s vision than Samsung’s. Instead of using TouchWiz to improve user experience, Samsung retains a grid-based metaphor, which means you’ll have to return to the home screen whenever you need to open a new app. Samsung’s agreement to “tone down TouchWiz” in favor of Android apps is a huge discredit to the Galaxy S5 since all that impressive hardware lies behind the UI and screen. Nobody knows the extent of the pressure Google placed on Samsung to avoid customizations, which would differentiate the S5 from the sea of other Android phones with similar interfaces. However, if you don’t mind the graphical style, you can easily overlook the interface and bask in the glory of the other features. The storage consumption is another glaring flaw that begs mention. Stock Android on other phones, like the Nexus 5, uses about 2GB of space. 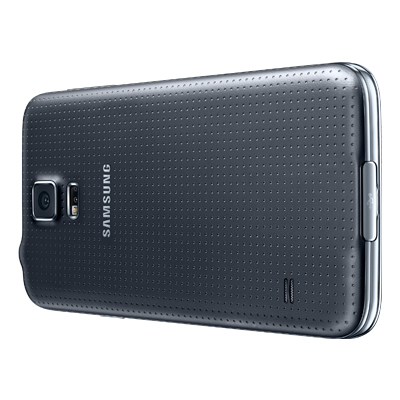 In sharp contrast, the S5 consumes a whopping 6GB of space. While it’s a simple fix to use microSD storage to compensate, it would be neat to not have all that bloatware to begin with. One saving grace (there may be others) is ‘Kids mode’. Once enabled, it locks the phone with access only to a simplified camera and parent specified apps and functions. This might not seem like much, but combined with waterproofing, it means you can safely leave your expensive phone within your kids’ reach. 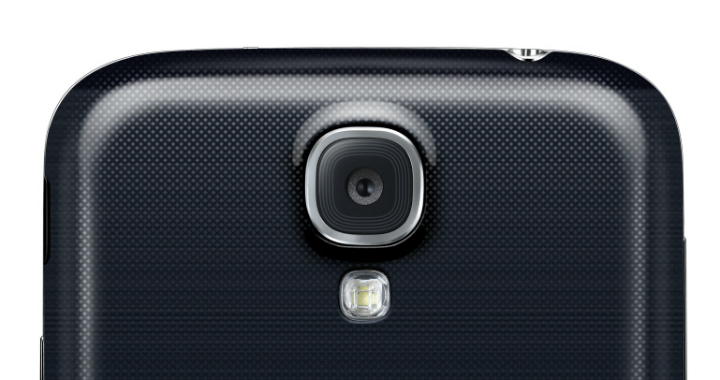 Users had only high praise for the S4’s camera, with good reason. The upgrade from 13 to 16 MP should give Samsung an obvious advantage – but there’s one shortcoming. Samsung doesn’t have the optical image stabilization (OIS) seen in Google’s Nexus 5, so there’s no escaping the occasional blurry picture. For a phone that received a host of needless functions, it’s a shame that Samsung didn’t think to include a function as crucial as OIS. This oversight seems to be the norm for Android phones, which is clearly evident from the lack of similar detail in the HTC One M8. As it stands, there’s no Android handset that could match the camera quality of the iPhone 5S or Nokia Lumia 1020. With an improved Android version, attractive hardware design, and one of the most stunning screens on the market, the S5 is the best Galaxy phone and might be a hairline ahead of its competitors. Some of its features may not stand up under real-world application, but other features, like the battery saving mode and water resistance, are extremely useful. 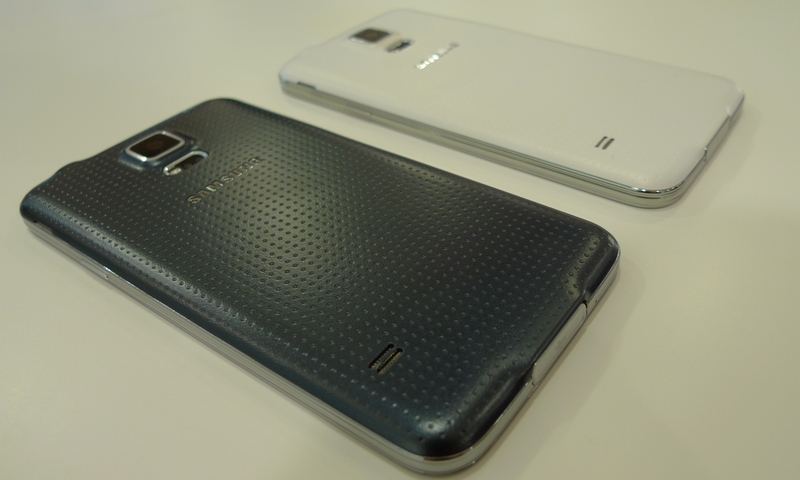 But did Samsung do enough to entice S4 users to upgrade? That’s left to be seen; apart from the improved camera quality, fingerprint sensor, slightly larger screen, and software features, there’s little else to look forward to. The upgrades might be enough to lure other Android users and perhaps some iPhone users. Apple’s refusal to build larger devices is a sore point for some of their diehard fans – so the promise of a larger display might appeal to some users. The S5 delivers a level of polish that Samsung has struggled for a long time to achieve. Critics can no longer complain about the company’s lack of detail as there’s an obvious focus on the end user. While the HTC One has garnered a lot of interest, it’s easy to predict that Samsung will likely continue to dominate the Android market. In terms of the overall market share, things might change if Apple releases a larger smartphone with revolutionary features. In the competitive smartphone market, makers are constantly tweaking and improving near-perfect devices. Samsung has taken their hit phone, the S4, and made it much better. There’s no doubt that eager consumers will line up to get their hands on this latest version, and it will be money well spent.